An air cleaner snorkel mounts to the air cleaner base to draw air into the air cleaner. Ford identified snorkels using basic part number 9A626. 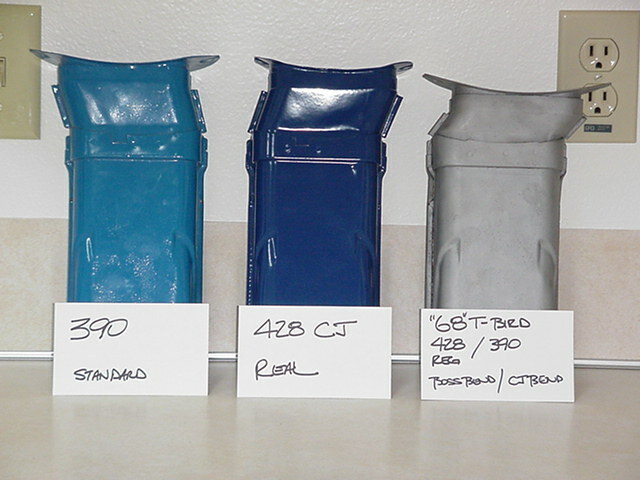 The 428 CJ snorkel is identified by part number C8OZ-9A626-C. 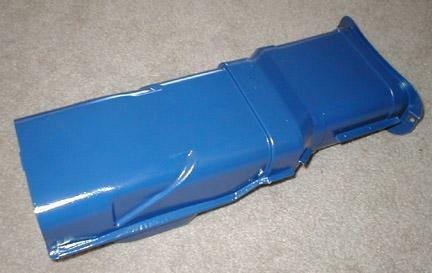 These stamped-steel snorkels are painted Ford Corporate Blue and are mounted to the air cleaner base with a pair of hex-head machine screws. 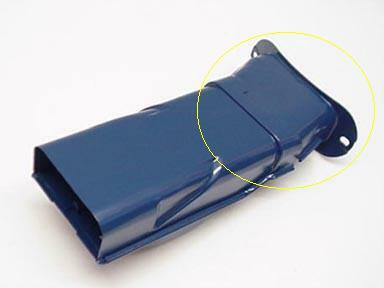 A circular opening used to mate with the s-tube (which should fit OVER the circular opening, not inside of it) can be found on the underside of the snorkel. 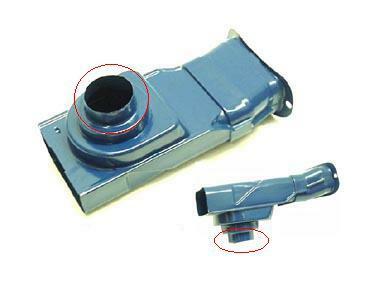 A thermal switch inside the snorkel controls air flow between the s-tube (to obtain warm air from the exhaust manifold at start-up) and the end of the snorkel (to obtain relatively cooler engine-compartment air after the engine warms up). An engineering part number of C8OF-9D626-A was originally stamped in ink on 428 CJ snorkels. 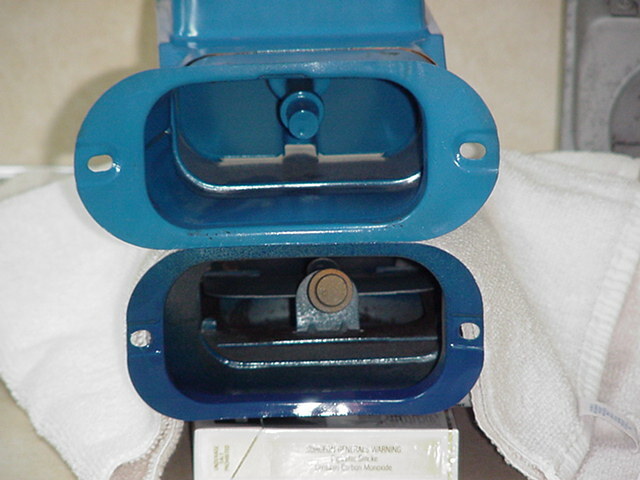 If it exists, this ink stamp can be found on the top, side, or underside of the snorkel. Here's a shot of the stamping on the underside of an original snorkel. I've also had reports of original snorkels being stamped with an engineering part number of C8OF-9D626-B. It could be that the snorkel was modified slightly during the course of production. It is important to note the bend in the part of the snorkel that attaches to the air cleaner base because this part of the snorkel is what distinguishes 428 CJ snorkels from other more commonly found FE snorkels. As shown in the image above (outlined in yellow), the 428 CJ snorkel bends towards the rear of the engine compartment before bending towards the front. 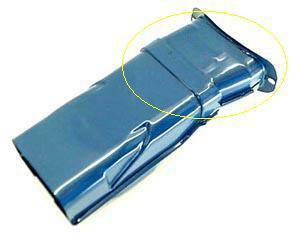 A common snorkel used on 1968 passenger car 390s and truck 360s bends towards the front of the engine compartment before bending towards the rear; see the picture below left with the bend outlined in yellow. I have heard that it's possible to remove the factory spot welds, flip the base, and re-weld to produce a snorkel that resembles a CJ snorkel, but if this is true there will still be some obvious differences. The mounting holes for the CJ snorkel are narrower and the curve in the base is a little greater, plus there's a distinctive ridge around the base of the CJ snorkel. If you have a snorkel that doesn't fit properly there's a good chance you have a fake. 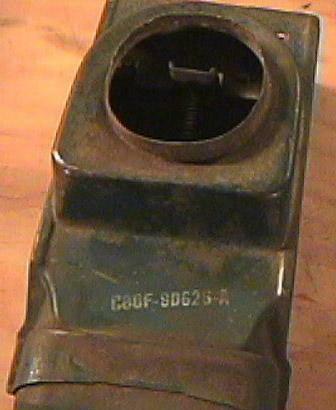 The snorkel used on the 1969 Mustang 390 is similar to the 428 CJ snorkel, except that it uses an additional circular adapter to mount the S-tube. Without the adapter, the 1969 390 snorkel is identical to the 428 CJ snorkel. The adapter is shown outlined in red in the picture below right. Here are a few more pictures showing the differences between the 428 CJ snorkel and more common FE snorkels. If you're the owner of a 1968 Shelby GT500KR, none of this applies to you. The 428 CJ engines originally installed in those cars used a snorkel that is again similar looking but different. Note the difference in the length of the section that mounts to the air cleaner base. Thanks to Bill Upham of Mansfield Restoration Parts for most of the pictures used on this page. Thanks to Bill Walker for the picture of the C8OF-9D626-A snorkel, Jack Wofford for the snorkel comparison pictures, and to Peter Disher for the picture of the Shelby snorkel.